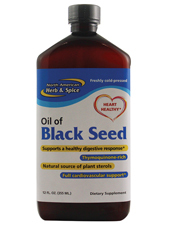 Product Description: Oil of Black Seed is the natural way to feed the cells of the body with a luscious, aromatic oil. It is fortified with potent antioxidative spice oils to make it shelf stable and prevent rancidity. This is the true, Thymoquinone-rich, 100% cold-pressed Mediterranean black seed oil. Oil of Black Seed is a natural source of Vitamin E, sterols, sterolins, melanin, omega-6s, and 9s. Suggested Use: Take one or more teaspoons daily. Makes a tasty addition to any food such as salad, soup, or vegetables. Also add to smoothies.